ImTOO Video to Picture for Mac is a Mac video to picture converter and capturer, which provides you with the flexible way to capture lively images from popular videos and output as static image, animation file, even HTML page. With this powerful Mac video to picture software, you can extract not only images in batches at once, but one separately as well. This Mac video to picture software helps you extract pictures from AVI, MPEG, WMV, DivX, MP4, RM, MOV, XviD, M4V videos, and save as JPEG, PNG, GIF and BMP image files, GIF and Flash animation, or HTML page. With the flexible capture mode, you can capture pictures in batches or take single snapshot directly. 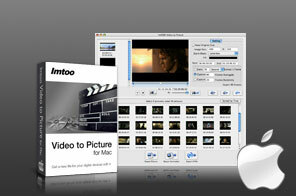 ImTOO Video to Picture for Mac also provides a picture list to preview the pictures captured from video files. More functions are offered to colorize your picture capture, for example, customize output image size, and add several videos to extract pictures simultaneously. Extract pictures from popular videos like AVI, MPEG, WMV, MP4, MOV, M4V, etc., and output them as static images in JPEG, PNG, GIF or BMP. Output the captured pictures as GIF animation and Flash animation in given frame delay. Save the captured video pictures as HTML page for viewing and uploading pictures more conveniently. Flexible capture modes help you to freely output desired video images: capture and output video images in batches, or take snapshot and output it in singles. A special picture list is available to show you all the captured pictures, from which you can preview the pictures, sort and replace them with better ones. Provide three batch capture methods: extract by time interval, capture averagely or randomly to free your capture. A video player is built-in to let you preview the added video for the convenience of capturing exact picture you want. Capture the current frame when playing and output it directly, or store it into the picture list for preview. Load different videos simultaneously, capture and output pictures respectively as different animations or HTML pages. You can also output pictures from different vides as one animation or HTML page. Accurately locate the pictures in the frame window with displaying all pictures in every 10/20/40 frames. Pick certain segment by setting the start and end time to remove unwanted part for convenient batch capture. Before batch capture, you can customize the output image settings: image size, zoom mode and edge color.